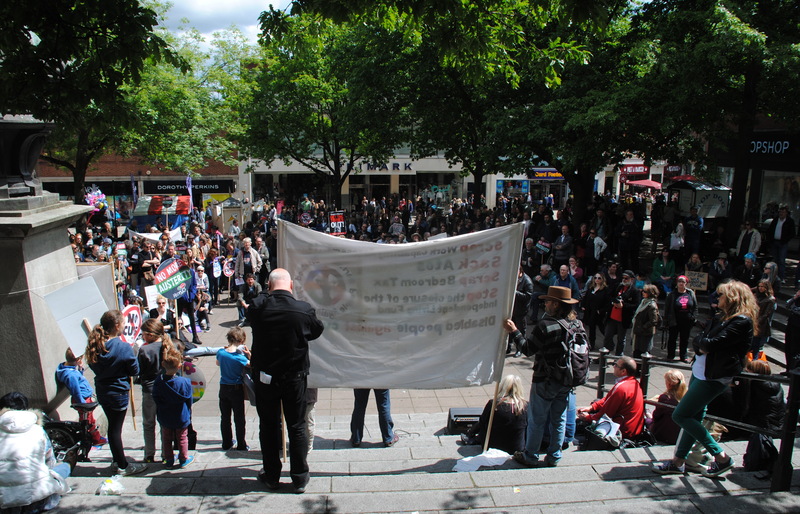 Saturday 30 May at midday saw several hundred people “depressed and angry about the election results” gather at the Norwich Haymarket who wanted “a more equal, fairer, kinder system…” standing together to find “a better way”. 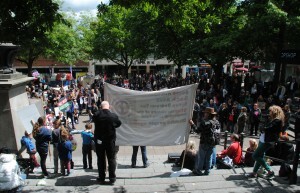 The growing local Norfolk People’s Assembly saw hundreds of local activists heed the call for a National day of Action from the UK People’s Assembly as a pre-cursor to a larger anti-government rally on 20 June in London. Some 475 joined the Facebook event and around 200-250 showed up at the Norwich Haymarket, nestled between McDonald’s, Top Shop, Next, Starbucks, and Primark. The statue of a pensive Sir Thomas Browne – the medic and author of “Vulgar Errors”, looked down upon the modern crowd, probably wondering why we hadn’t yet solved 17th century problems of inequality and poverty, more than 3 centuries later. 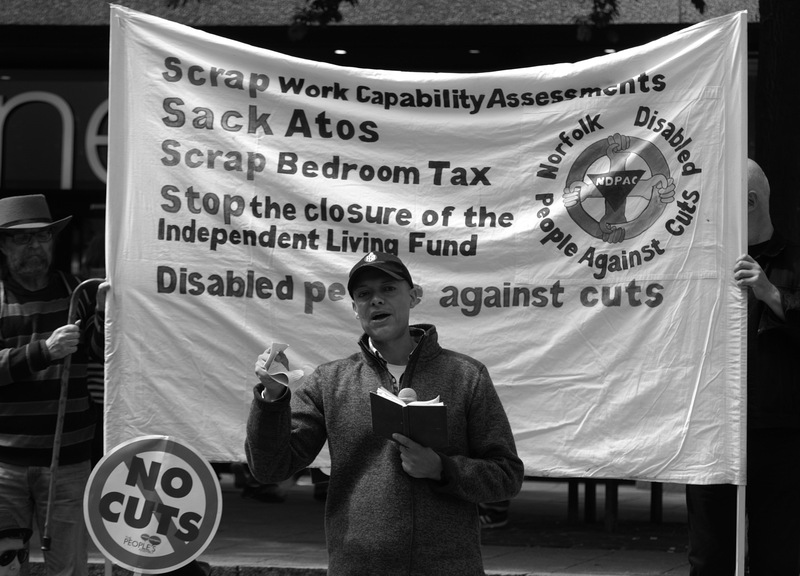 Banners for Saving Mental Health Services in Norfolk and Suffolk (currently in special measures), the Norfolk People’s Assembly and DPAC Norfolk (Disabled People Against Cuts) were unfurled along with dozens of printed and home made anti-austerity signs held aloft by arms weary after 5 years of Coalition cuts and now faced with another 5 years of threatened welfare budget reductions under the recently elected Conservative Party. 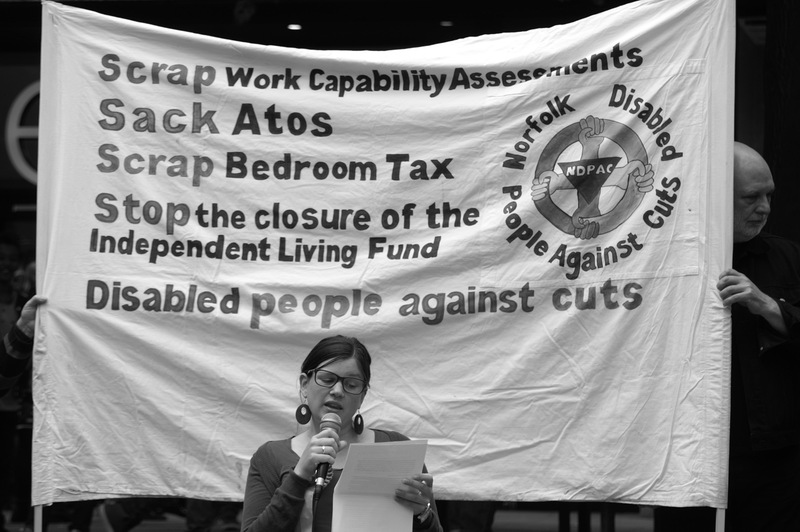 Diverse people representing numerous special interest bodies such as Save the NHS or the Hewett School, students, unemployed, disabled groups, political parties, affiliations and none, all called in unison for an end to the cuts and austerity. 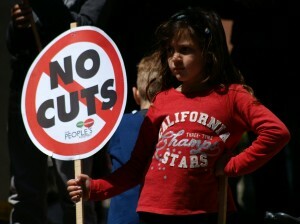 A lone young female heckler raised a sober voice saying that “you people on benefits already get too much”. Perhaps, influenced by the hardline Right wing and Ukip rhetoric in the East of England during the recent election campaign. If the personal is political then that rang true of speakers from across the board, less because it was about them, more because of the passion with which they spoke for and on behalf of others but from the depths of personal experience of austerity and cuts to their sectors or own lives. 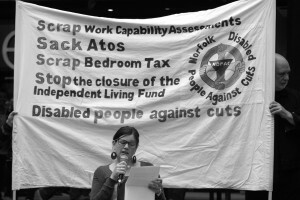 Speakers from the rally organisers, included Jan McLachlan, representatives of the Green Party, and Mark Harrison of the disability charity Equal Lives who drew attention to the ongoing access issues at the Duke Street work capability assessments centre. 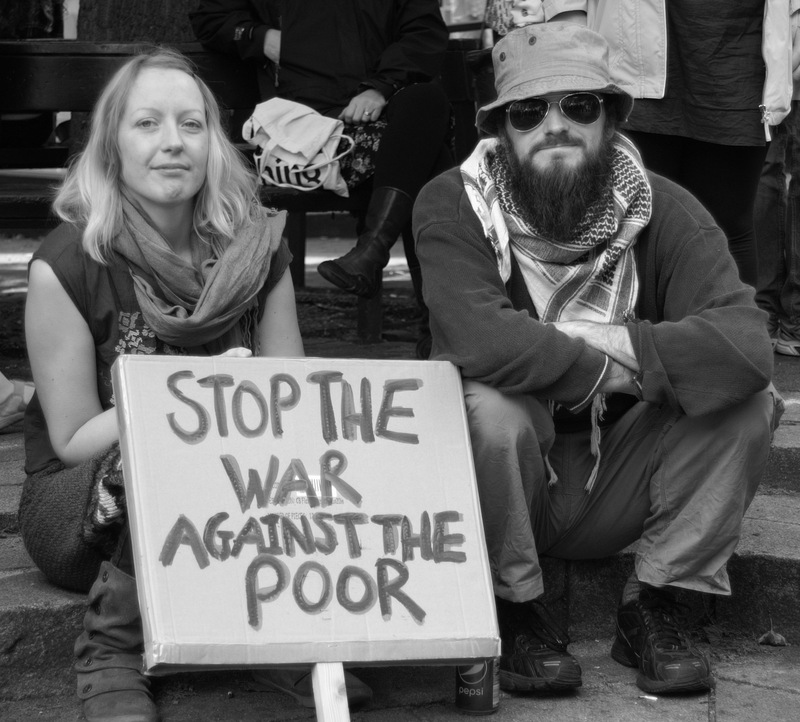 Recently elected local Labour MP for Norwich South – Clive Lewis, suggested that even illegal direct action may be necessary to oppose immoral laws and Government inaction. Lewis spoke in an impassioned way that would probably shame the current batch of Labour leadership hopefuls and their copycat “aspirations of hard working families” soundbites. 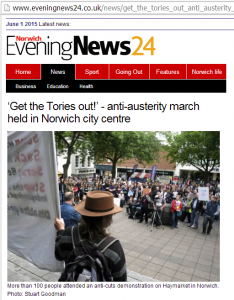 If Monday is a slow news day, then posting about Saturday’s event, also on the EDP site, has led to 44+ comments, the most commented on article today (58 now). 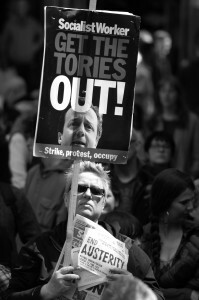 More photographic coverage on Demotix. Education was well represented by Ian Anderson a spokesperson for the We’re backing Hewett campaign, UEA staff, and Postgraduate Education officer UEA Students Union Liam McCafferty. 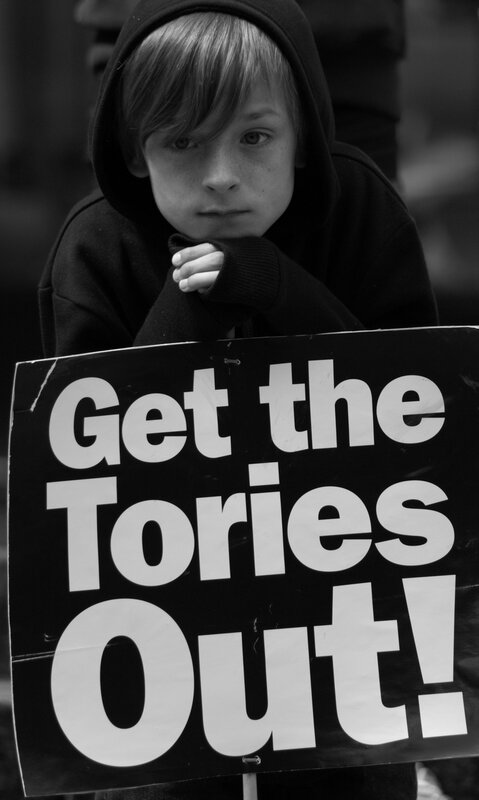 Liam, depressingly depicted a dystopian future where people would not be able to afford higher education. Local deputy head teacher, NUT Campaigns Coordinator, Norwich Pride Chair and social activist, Nick O’Brien mentioned the reportedly over 27,000 children in Norfolk now living in poverty, at increased risk of poor health and educational achievement, whilst more than half a dozen children of protesting parents were happy, beyond most young kids’ attention spans, to hold up placards drawing attention to the plight of people of all ages and abilities under the current cuts. 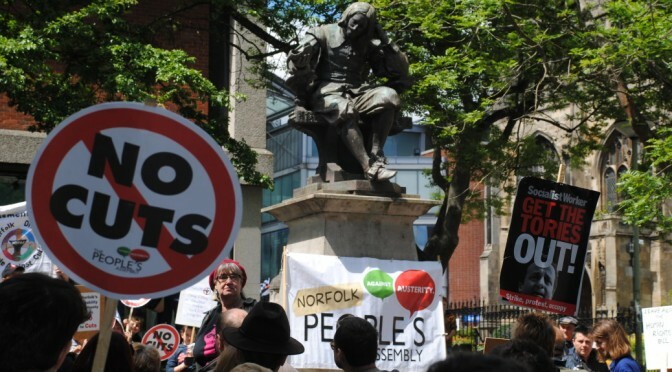 We at the People’s Assembly are steadfastly opposed to the Tories vicious plans for Britain, and the implications they will have for the people of Norfolk. 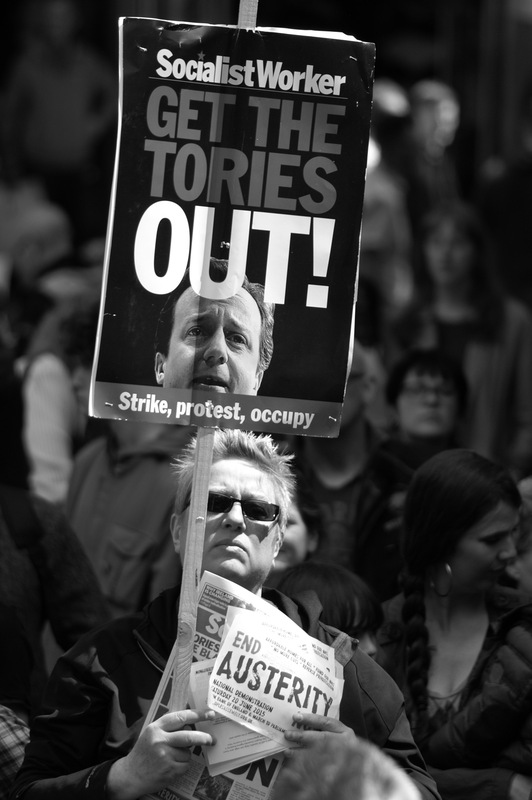 On David Cameron’s watch as Prime Minister, the country has become bitterly divided along the lines of wealth inequality. 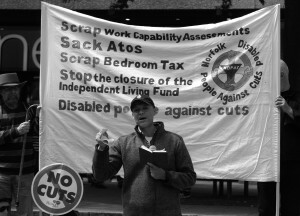 His government’s cuts have shamefully targeted society’s most vulnerable – from the disabled, to the unemployed, to the unborn. Whilst the Conservatives have been selling off the NHS through the backdoor, Britain’s infant mortality rate has risen to become the highest in Western Europe. 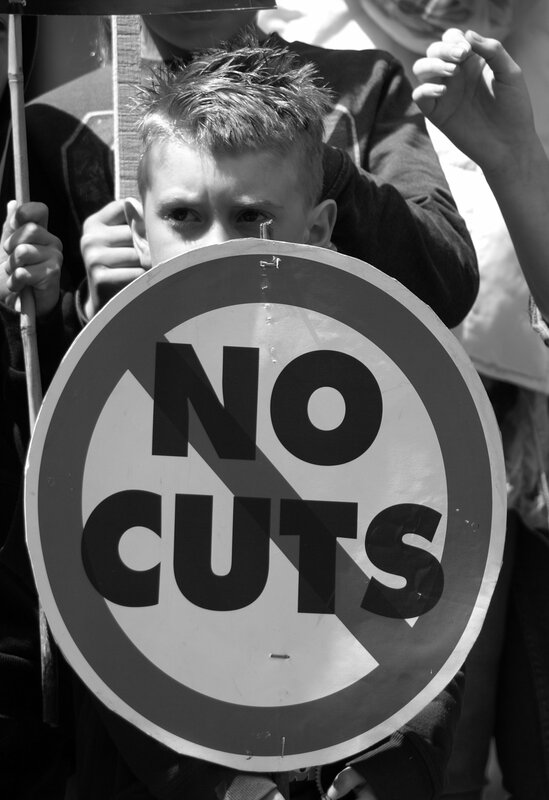 Since 2010, the Black Triangle campaign estimates more than 80 suicides have been directly linked to cuts to social security – as those who need help most have been driven to desperate decisions by the Tories’ savage austerity measures. Over the duration of the last Parliament, the government have also butchered our legal rights by cutting legal aid – and are currently poised to axe the Human Rights Act, which currently protects ordinary citizens of all races from torture and persecution. 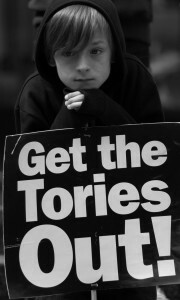 They have dismantled the comprehensive education system with their failed Free Schools and Academies scheme, turning schools like Hewett into profit-driven production lines, and they have tripled tuition fees – essentially ending the chances of a generation to learn beyond a GCSE level. We have a clear choice for the next 5 years then. If we want to live in a world without an NHS, without universal education, without opportunity, without hope, then we need only sit back and wait for 2020’s election to at best deliver us cuts from a different party. 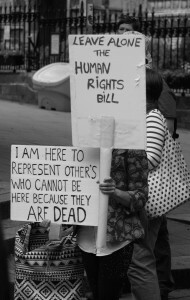 If however, we are intent on not only protecting the ideas of freedom, opportunity and the right to live with dignity, but also determined to literally save hundreds of lives, and to provide our children with a future worth living, then we must stand together now. 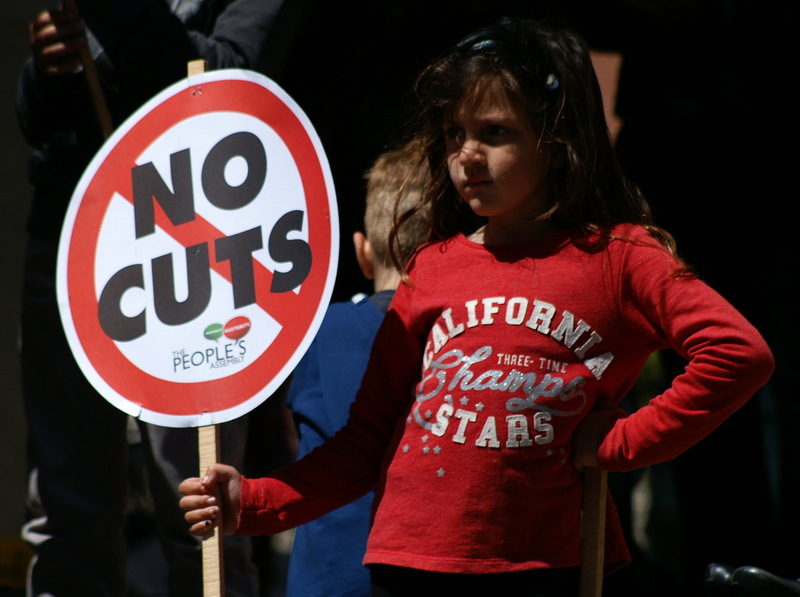 Over the coming months, across the country from Glasgow to Newcastle, to Liverpool to London, the People’s Assembly plans to take action to stop David Cameron’s gang of market-extremists in their tracks, and build a better alternative. 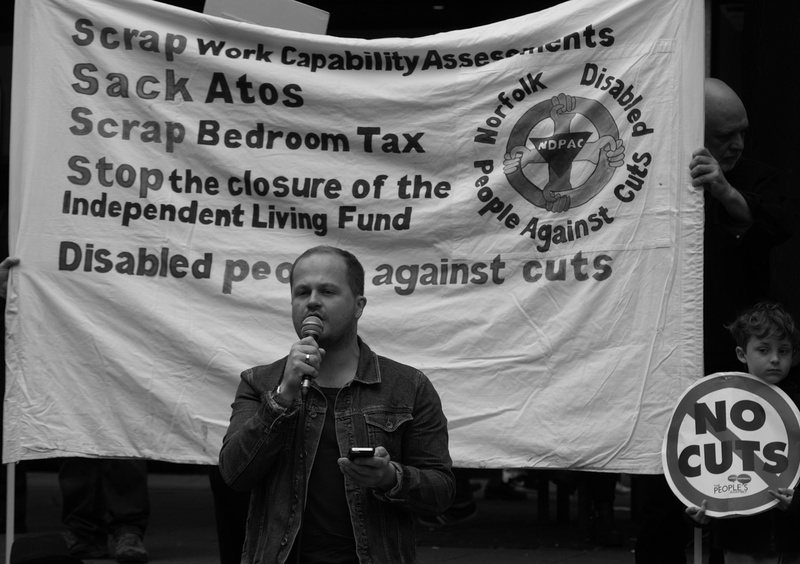 For us, the fightback starts here, in Norwich. 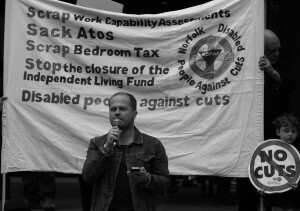 More photos of the Norfolk People’s Assembly Norwich rally here.